India’s 1.22-billion-strong population is showing a growing demand for high-quality dairy products. UHT milk, gourmet cheeses, probiotic and nutritional drinks, and flavored milk are now commanding more retail shelf space. One might think that for a country that produces the highest amount of milk on earth, responding to this trend would be easy. But that is not quite the case. Although India boasts nearly 146.3 million tonnes of annual milk production, according to the Indian government’s Economic Survey 2015-16, its dairy industry loses a substantial amount of milk every year to an underdeveloped refrigeration chain. The lack of timely refrigeration also means that the quality of milk is often compromised. This is arguably the most concerning factor for Indian dairy processors and farmers at the collection level. The Promethean Power Systems team believes that the challenges in the dairy supply chain can be addressed by implementing innovative refrigeration technology to reduce spoilage and improve milk quality. The Indian dairy industry faces significant challenges including poor milk quality, high transportation costs, high operating cost, and fragmented milk supply. Underpinning that is the lack of timely refrigeration, which often stems from unreliable power supply. A diesel generator for power backup is the current option for village-level chilling. But this solution is expensive, needs recurring maintenance, and is less eco-friendly. Part of the problem that is restricting village-level milk collection is the complexities associated with the hub-and-spoke model of milk collection. Grama noted that a wider milk collection radius means lower milk quality and higher operating costs. But distributed chilling coupled with diesel-free power backup can help solve this problem. 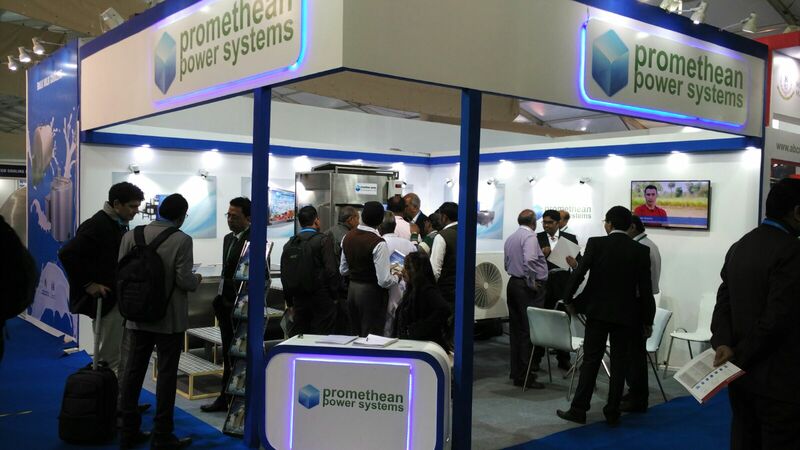 Promethean’s patented thermal-energy-storage-based chilling systems from 500-2000L capacity can serve up to 60-70 dairy farmers in villages, giving them the confidence to deliver more milk to their nearest milk collection center. The thermal storage system stores grid energy when it is available, and releases that stored energy to chill milk when the need arises. With thermal energy storage being a more cost-effective replacement for diesel-generator backup, collection centers and dairy processors are assured of better quality and volumes of milk as well as lower opex. This, in turn, creates greater value for the Indian consumer. The points that Grama discussed tie in with what T Nanda Kumar, former chairman, National Dairy Development Board (NDDB) said in his keynote speech at the DIC. “The structure of milk production is likely to change. Our milk producers will increasingly adopt new technologies in milk production. Alternatively, small-farmer-friendly machines may come into play… even within the smallholder production systems, improvisation through adoption of modern technology will become prominent,” Mr. Kumar said.